Larry took inspiration from the show and began work on his opus. More Allan Sherman than Alan Lerner, he had always written parodies set to well-known songs and now he took this talent and ran with it. The First Annual Samoan Fales of 1965 was an unapologetic rip-off of Your Show of Shows, That Was The Week That Was and every terrible pun ever written. The plot was incidental, something about a tour guide showing people around Samoa, but the loose structure gave him and his writing partner Bill Wiley leeway to insert a running commentary about the TV studio, the government and life on the island. A sample bit: Girl comes onstage and asks Larry for a glass of water. He pours her one and she exits. A few minutes later, she comes on and asks again and exits with the water. The third time she comes on and asks, Larry says “You sure are thirsty.” She replies, “Oh, I’m not thirsty at all. Studio 3 is on fire!” Rimshot! The Fales were such a hit that Larry and Bill went on to write two more versions of the show in 1966 and 67. While the first two productions had more of a variety show feel, the last one had an actual plot and was called A Funny Thing Happened on the Way to Samoa. Never one to worry about nepotism, Larry had cast all of his children in a variety of small roles in each production. In the last year, 12-year old Chrissie finally made her stage debut in a featured role – she played the young daughter of a family who move to American Samoa. The word “typecast” was thrown around by her sisters, but she knew this was her finest moment on the island. She had lines, she sang, she danced! She also heard her father tell her mother, “For God’s sake, get her a bra or I’m going to have to recast the part.” That was the last time she ever played an ingénue. “The Samoan Fales are over, and I must modestly admit they were a smashing success. We drew over 600 people in two nights and added almost 400 bucks to the treasury of the Island Community Theatre. The show was such a hit last year that most of the people on the island were looking forward to this one. Bill Wiley and I collaborated again on writing, producing, and directing it. Since Bill is very musical, I concentrated on the lyrics and comedy lines and sight gags, mostly corny stuff like a guy who comes across the stage pulling a huge rope, disappears while the rope is still being pulled, and then appears again on the other side of the rope pulling in the opposite direction–real high class stuff! The song parodies went over well with the local audience. I wrote a set of lyrics to the tune of the “Mickey Mouse Club” theme, which is now being shown on night-time TV. We had a mock TV set and six ladies wearing Mickey Mouse T-shirts and ears. They sang about H. Rex Lee, the governor of American Samoa, to the tune of “Mickey Mouse”. The Governor came over and congratulated Bill and me after the show and said he and his wife really enjoyed it. *A quick primer in the Samoan language: a fale is the name of the native Samoan house – a circle of poles with a thatched roof on top. The word fale is pronounced “folly”. Therefore, The Samoan Fales is the same as The Ziegfeld Follies, but with chunkier showgirls. 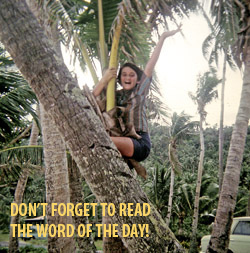 Don’t miss the new page added (tab at top between Introduction and Word of the Day) called The Samoan Fales Excerpts, which is, oddly enough, excerpts from the scripts and pictures of The Samoan Fales! Is this Hoss? I always get confused because the email says Helen Carter, whom I believe is your mom. (sorry if I have that completely wrong). I think someone from your family (probably your dad) played the guy on the motorcycle in one of the productions. Check out the The Samoan Fales Excerpts page and see if you recognize any of the dialogue. I don’t see the attachment with the program, but if want to email it to me directly, I will add it to the page (christinebroquet@yahoo.com). I wish that someone had used the relatively new tape-recording technology to capture all the productions of the Samoan Fales, and saved them! Another great post, Chrissie. Thanks for all the fun I’m having reading them. I also have a copy of the ’67 script and a separate listing of the musical numbers. I’ll ship those to you directly. George, I have a (bad) recording of the ’67 show. Rick Bates taped it for playback on WVUV. The audio’s lousy–a one-mike pickup high above the stage apron, so everything’s pretty boomy. But it’s audible–mostly. I’ll get a copy of this to Chrissie as well.